• Have at least 7 years of post qualification experience of Town Planning and Urban Development sector on a responsible position. • Possess basic knowledge of computer application and should be conversant with AutoCad. • Have at least 2 years of post qualification experience of Town Planning and Urban Development sector. • Possess basic knowledge of computer application and should be conversant with Auto-Cad. • Possess a Bachelor’s Degree in Architecture or in Civil Engineering or should have Bachelor’s Degree in Planning recognized by ITPI or other equivalent qualification of any recognized University. • Not be more than 30 years of age. a) This appointment is temporary on purely contractual basis for a fixed period and at the end of which the same shall stand terminated unless extended. b) These posts are based at the office of ‘Town Planning Officer’ of Special Investment Regional Development Authorities. How to Apply: Filled in application with relevant documents to be submitted at address given below within 10 working days from the publication of the advertisement. The application may be sent by Regi. Post or Speed Post only. 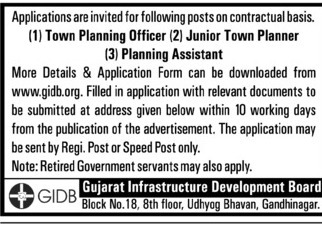 Address: Gujarat Infrastructure Development Board (GIDB), Block No. 18, 8th floor, Udhyog Bhavan, Gandhinagar.